A search for “Storm” in the song title brought the following playlist on my iPod. Clearly the timing on some of them makes a difference to a true playlist. This is simply an alphabetical list. of the privileges that are mine. food that needs no cooking. still others none at all. with the privileges that are mine? If the power goes off, it is always good to have a plan to know that the power has been restored. Not sure when I took this one – might have been back in July on my way home from preaching at Church of the Covenant. It seems appropriate to post this one tonight. Tomorrow around noon the MTA is suspending service in anticipation of Hurricane Irene – or Tropical Storm Irene – or whatever may come our way. I wonder what I should wonder. I was in Louisville on September 11, 2001. I had just returned from the World Conference against Racism. A friend flew into town from the same conference – scheduled to arrive on the evening of September 10. Because of flight issues, my friend ended up taking a taxi from Cincinnati that arrived at the Louisville airport early on the morning of September 11. A phone call from another friend later that morning brought me the first word of the day’s event. It was a dazed day, even at that distance. In many ways, I continue to sort through the day and its meaning. Now as the 10th Anniversary approaches, I find myself living in New York. The proximity fills the day with new meanings that lead me to ponder more deeply and work through in new ways. I have not been to the World Trade Center site yet. Ever. I plan to take part in the events commemorating September 11 including the worship service of the Presbytery of New York City. I think I will go to the site before September 11. I have helped the Presbyterian Church (U.S.A.) gather resources for the anniversary. I have promoted the work of Prepare New York. Today, in a worship service at the Church Center for the United Nations led by the Presbyterian Ministry at the United Nations, we adapted a liturgy from the National Council of Churches created by written by the Rev. Dr. Eileen Lindner and the Rev. Jon Brown. 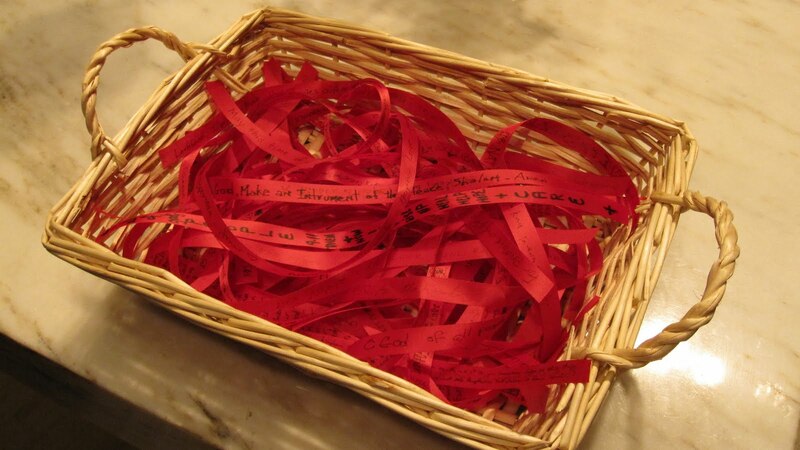 In the places where the services suggested lighting candles, we invited people to write prayers of remembrance, comfort and hope on simple red ribbons. Ryan Smith read scripture; Peng Leong led the time of prayer; Kevin O’Hara from the Lutheran Office for World Community led the benediction. Thanks to all my friends who helped me pick a song! These ribbons will become part of the Ribbons of Hope display in Battery Park on the weekend of Septmbe 11, 2011. May memory now reside in us at peace. May comfort companion us in all our days. May hope spring forth in us by the power of the Holy Spirit. May we serve God in all that you do and say, witnessing to the reign and realm of God to come. Amen. to reach another, better point.